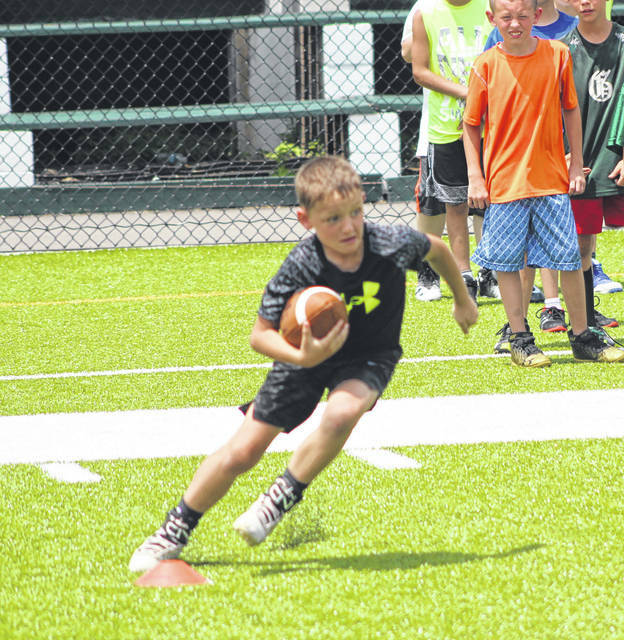 More than 30 Greenville Youth Football Camp participants learned the proper techniques for tackling during drills on Tuesday at Greenville High School. The three-day camp, which concludes today, is for students entering grades 2-6 in the 2018-19 school year. 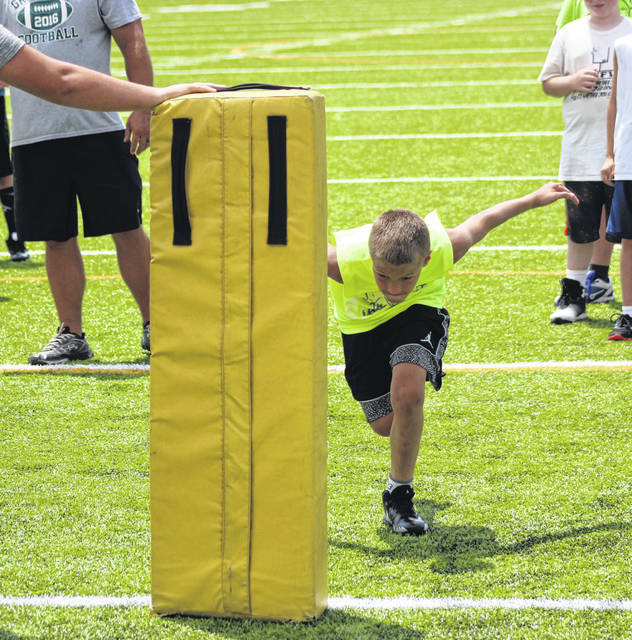 This young camper takes his turn with the tackling dummy on Tuesday during the Greenville Youth Football Camp. More than 30 kids entering grades 2-6 participated in the three-day event, which concludes today, at Greenville High School. This camper makes a cut during running back drills on Tuesday at the Greenville Youth Football Camp. More than 30 kids entering grades 2-6 participated in the three-day event, which concludes today, at Greenville High School. The fifth-grade group brings it in for a chant before taking a break from the heat on Tuesday during the Greenville Youth Football Camp. More than 30 kids entering grades 2-6 participated in the three-day event, which concludes today, at Greenville High School. 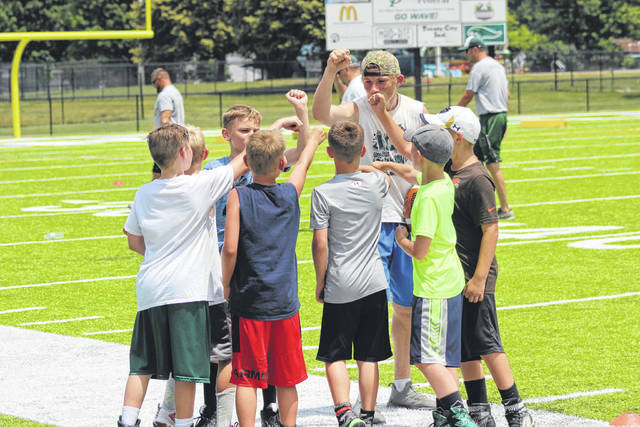 GREENVILLE – It’s all about fundamentals and proper technique, Greenville football coach Aaron Shaffer said Tuesday during a break from the youth football camp. 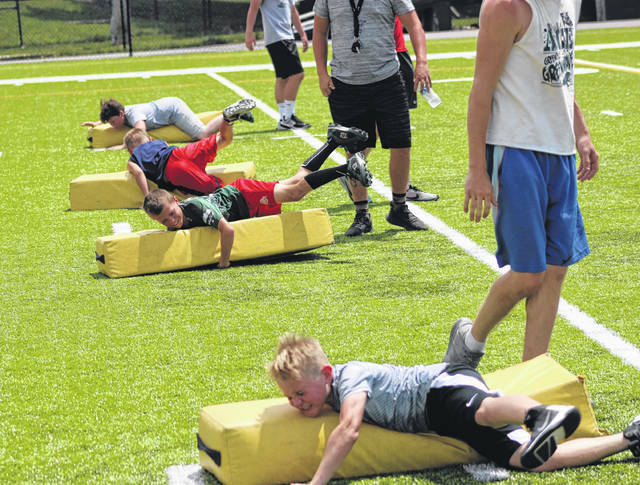 “The camp is designed for our second- through sixth-graders and it is a fundamentals and skills camp where we try to teach them some of the very basics of football,” Shaffer said. “Some of these guys will be playing football for the first time this fall with our GYFL teams, and for some of them this will be all the football they get besides the Light Camp last week. “We are just trying to build some of those fundamental skills that we think are important as a program so that we can start laying that foundation for their success in the middle school and the high school,” he added. The three-day camp, which concludes today, had 34 campers registered, according to Shaffer, although he added that some may have come and left periodically due to the extreme heat. “Today we started with tackling drills,” Shaffer said. “We as adults know how important it is that we try to teach proper tackling techniques with all the awareness about concussions. We want to put our kids in the safest position that we can in terms of tackling. Shaffer also said some of the things Greenville has done is to update its equipment to the best it can possibly be for the kids. After taking a break from the heat, the campers then participated in running back drills where they learned how to take a handoff and make proper cuts and then later in the day Shaffer said the kids would learn more about playing on the offensive line and such things as getting into a proper stance. With the heat of the day, Shaffer also talked a lot about proper hydration and making sure the kids took plenty of water breaks. “It’s been a good couple of days here with it being so hot,” Shaffer said. “We try to teach them about hydration and appropriate techniques on how to pre-hydrate, hydrate during and post-hydrate. We talk about eating right and making sure you are taking care of your body. When it’s hot like this your body is really working hard to give you the ability to perform. Shaffer said this is the fifth year for the youth camp and he has quite a few familiar faces among the group. This entry was tagged Aaron Shaffer, Greenville football. Bookmark the permalink.